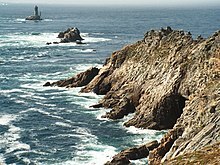 The word Brittany, along with its French, Breton and Gallo equivalents Bretagne, Breizh and Bertaèyn, derive from the Latin Britannia, which means "Britons' land". This word had been used by the Romans since the 1st century to refer to Great Britain, and more specifically the Roman province of Britain. 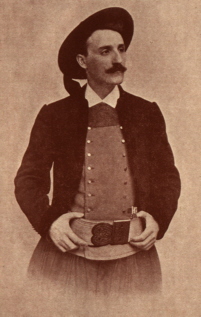 This word derives from a Greek word, Πρεττανικη (Prettanike) or Βρεττανίαι (Brettaniai), used by Pytheas, an explorer from Massalia who visited the British Islands around 320 BC. The Greek word itself comes from the common Brythonic ethnonym reconstructed as *Pritani, itself from Proto-Celtic '*Kʷritanī from Proto-Indo-European *kʷer ' to do. 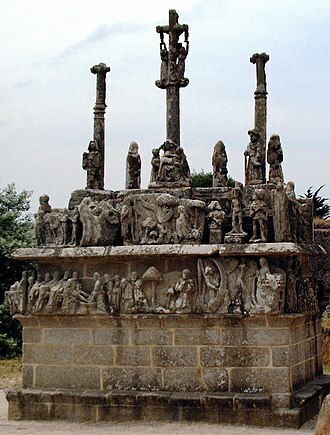 The Romans called Brittany Armorica, together with a quite indefinite region that extended along the English Channel coast from the Seine estuary to the Loire estuary, and according to several sources, maybe along the Atlantic coast to the Garonne estuary. This term probably comes from a Gallic word, aremorica, which means "close to the sea". 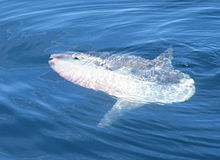 Another name, Letauia (in English "Litavis"), was used until the 12th century. It possibly means "wide and flat" or "to expand" and it gave the Welsh name for Brittany: Llydaw. 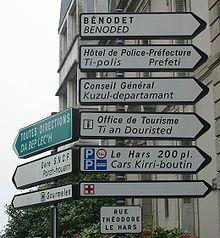 Breton is a Celtic language derived from the historical Common Brittonic language, and is most closely related to Cornish and Welsh. It was imported in Western Armorica during the 5th century by Britons fleeing the Anglo-Saxon invasion of Britain. 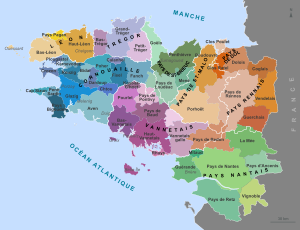 Since the 13th century, long before the union of Brittany and France, the main administrative language of the Duchy of Brittany had been French, which had evolved Latin. 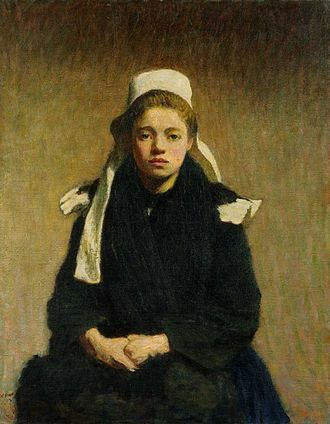 Breton remained the language of the rural population, but since the Middle Ages the bourgeoisie, the nobility, and the higher clergy have spoken French. 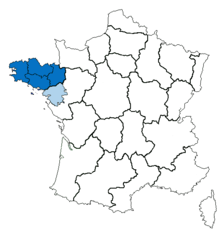 Gallo is spoken on the eastern half of Brittany. It is not itself a Celtic language. 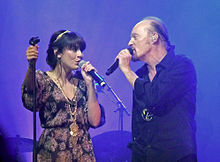 Like French, it is also descended from Latin (and is classified in the Langues d'oïl branch), but has some Celtic influences, particularly in its vocabulary, whereas French has influences from Frankish (the Germanic language which preceded Latin in the rest of France). The toponym is based on the Gaulish phrase are-mori on/at sea, made into the Gaulish place name Aremorica Place by the Sea. The suffix -ika was first used to create forms and then. The original designation was vague, including a part of what became Normandy in the 10th century and, in some interpretations. 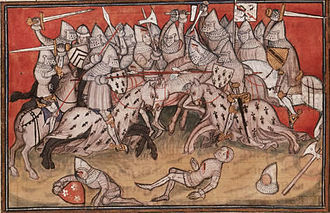 Later, the term became restricted to Brittany, in Breton, on sea is war vor, though the older form arvor is used to refer to the coastal regions of Brittany, in contrast to argoad for the inland regions. 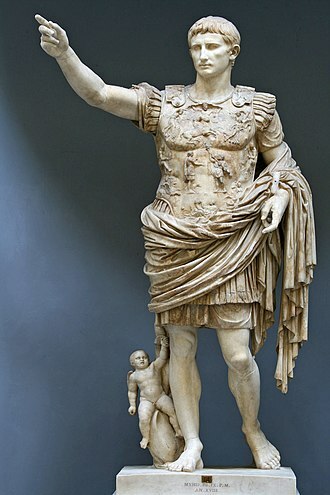 Pliny the Elder, in his Natural History, claims that Armorica was the name for Aquitania. 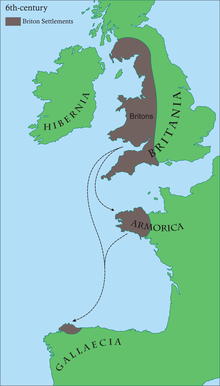 Trade between Armorica and Britain, described by Diodorus Siculus and implied by Pliny was long-established and this prehistoric connection of Cornwall and Brittany set the stage for the link that continued into the medieval era. Still farther East, the typical Continental connections of the Britannic coast were with the lower Seine valley instead, archeology has not yet been as enlightening in Iron-Age Armorica as the coinage, which has been surveyed by Philip de Jersey. 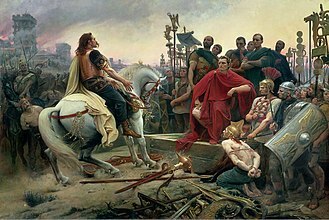 Under the Roman Empire, Armorica was administered as part of the province of Gallia Lugdunensis, when the Roman provinces were reorganized in the 4th century, Armorica was placed under the second and third divisions of Lugdunensis. Jordanes lists Aëtius allies as including Armoricans and other Celtic or German tribes, the Armorican peninsula came to be settled with Britons from Britain during the poorly documented period of the 5th-7th centuries. Even in distant Byzantium Procopius heard tales of migrations to the Frankish mainland from the island, largely legendary for him, of Brittia. 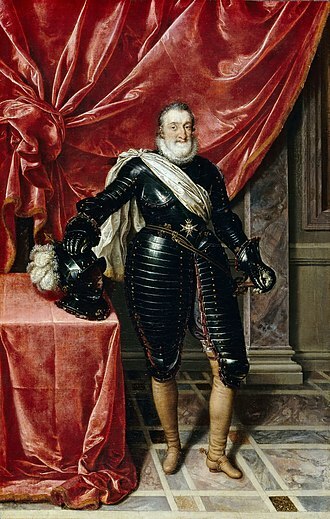 These settlers, whether refugees or not, made the presence felt of their coherent groups in the naming of the westernmost, Atlantic-facing provinces of Armorica and these settlements are associated with leaders like Saints Samson of Dol and Pol Aurelian, among the founder saints of Brittany. Still, questions of the relations between the Celtic cultures of Britain— Cornish and Welsh— and Celtic Breton are far from settled, Martin Henig suggests that in Armorica as in sub-Roman Britain, there was a fair amount of creation of identity in the migration period. Pre-Brythonic Armorica includes the ancient megalith cultures in the area and the Celtic tribal territories that existed before Roman rule. 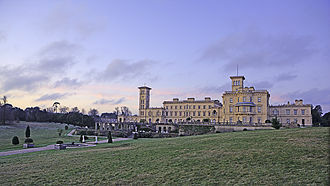 After the collapse of the Roman empire, large migration from Great Britain led to the foundation of British colonies linked initially to homelands in Cornwall, Devon. The independent Breton kingdom developed into the Duchy of Brittany, after the French Revolution Brittany was abolished as an administrative unit, but continued to retain its distinctive cultural identity. 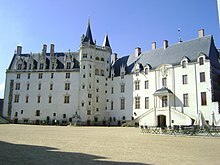 Its administrative existence was reconstituted, in reduced size, as the Region of Brittany in the mid-20th century, the history of Brittany begins with settlement beginning in prehistoric times, beginning around 700000 BCE. 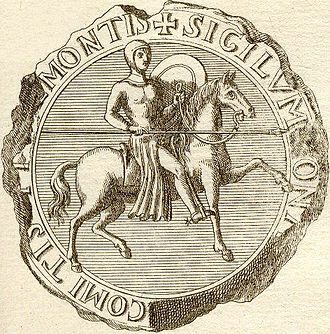 It was inhabited by Gallic peoples including the Veneti and the Namnetes in the first centuries BCE before these territories were conquered by Julius Caesar in 57 BCE, and progressively Romanized. As part of Armorica since the Gallo-Roman period, Brittany developed an important maritime trade network near the ports of Nantes, Vannes, in order to prevent Breton incursion, the neighbouring Frankish kingdom created a Breton borderland incorporating the counties of Rennes and Nantes. From the sixth to ninth centuries, the Merovingian dynasty and the Carolingian dynasty tried to integrate the region into the Frankish kingdom, with limited and ephemeral success. The union of the region as Brittany occurred in 851 under King Erispoë, son of Nominoë, the War of the Breton Succession lasted from 1341 to 1364 against the backdrop of the Hundred Years War. 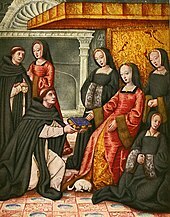 An autonomous power emerged in the fourteenth and fifteenth centuries, maintaining a policy of independence from France, the union of Brittany to France occurred in 1532. 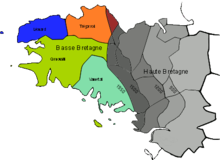 The Breton province maintained relative autonomy and benefited from its own institutions, Brittany was dissolved in 1789 and divided among the departments of Côtes-du-Nord, Finistère, Ille-et-Vilaine, Loire-Atlantique and Morbihan. 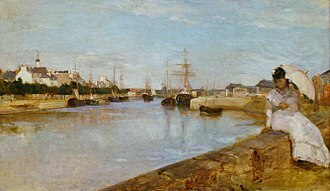 After a long nineteenth century marked by a modernization of agriculture and by huge increases in population, although a traditionally conservative region, Brittany saw the rise of workers movements in cities such as Brest and Saint-Nazaire. 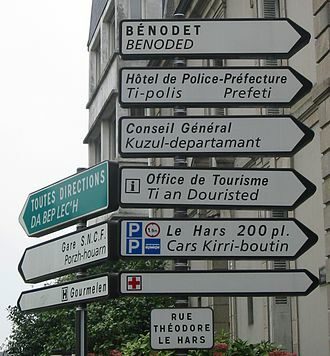 The First World War was an important turning point for Bretons, who discovered new ways of life, the question of the proper place for the Breton language and regional traditions became the central element of a political movement which began to emerge in the same era. A long process of modernization took place from the 1920s through the 1970s, the Paleolithic period of Brittany ranges from 700000 to 10000 years BC. Traces of the oldest industries were found in the valley of the Vilaine river. 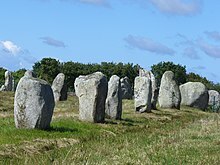 The oldest traces of habitat are located in Saint-Colomban, in Carnac, in addition to pebble, bifaces are found there, and the site dates to 300,000 BC. Acheulian bifacials from this period are found along the sea coast, as Treguennec, the oldest traces of fire use are found on the site of Menez Dregan with a date making them up to 400000 years BC. 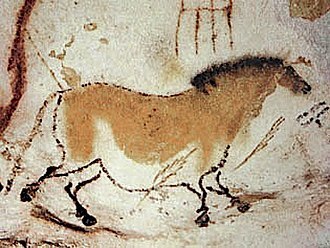 The few human groups are made of hunter-gatherers. From the Middle-Mousterian period, remain two outstanding sites in the region, in Mont-Dol where scrapers were found in a site dated to 70,000 BC. The flag of Brittany is called the Gwenn-ha-du, which means white and black in Breton. 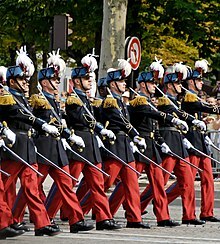 Nantes, its préfecture, was one of the two capital cities of Brittany. The flags dimensions are not fixed and may vary from 9 cm ×14 cm to 8 m ×12 m, the flag is not only used by cultural associations or separatists but by other people. 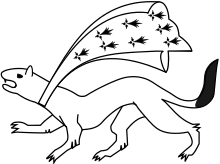 It is widely used throughout Brittany and can even be seen on town halls in the region, because of the absence of legislation concerning regional flags in France the flag is flown on sailboats and fishing boats. The design of the spots can vary, but the version most frequently seen is shown above. The flag was created in 1923 by Morvan Marchal and he used as his inspiration the flags of the United States and Greece as these two countries were seen at that time as the respective symbols of liberty and democracy. 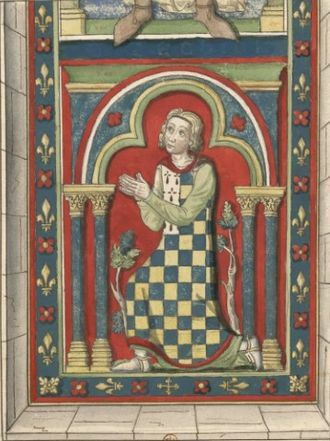 The nine horizontal stripes represent the traditional dioceses of Brittany into which the duchy was divided historically, the ermine canton recalls the ducal arms of Brittany. Saint-Malo is a walled port city in Brittany in northwestern France on the English Channel. It is a sub-prefecture of the Ille-et-Vilaine, traditionally with an independent streak, Saint-Malo was in the past notorious for privateering. Today the city is a major tourist destination, with many ancient, the population can increase to up to 200,000 in the summer tourist season. 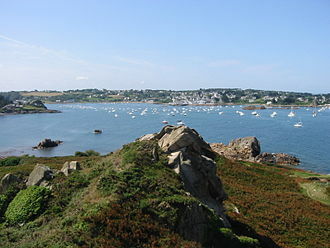 With the suburbs included, the population is approximately 153,000, the population of the commune more than doubled in 1968 with the merging of three communes, Saint-Malo, Saint-Servan and Paramé. 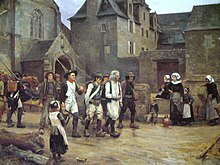 Inhabitants of Saint-Malo are called Malouins in French, from this came the name of the Malvinas – the Falkland Islands named Îles Malouines by French explorer Louis-Antoine de Bougainville in 1764. 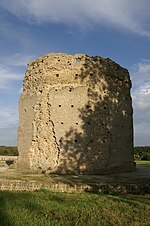 Founded by Gauls in the 1st century B. 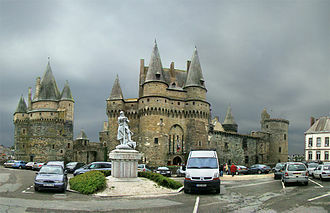 C, the ancient town on the site of Saint-Malo was known as the Roman Reginca or Aletum. By the late 4th century AD the Saint-Servan district was the site of a major Saxon Shore promontory fort that protected the Rance river estuary from seaborne raiders from beyond the frontiers. 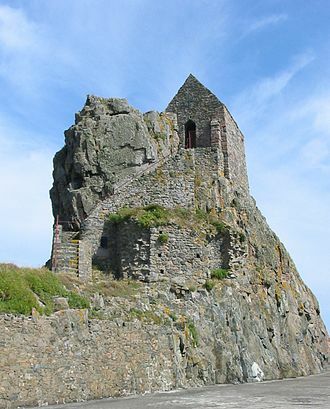 According to the Notitia Dignitatum the fort was garrisoned by the militum Martensium under a dux of the Tractus Armoricanus and Nervicanus section of the litus Saxonicum, the modern Saint-Malo traces its origins to a monastic settlement founded by Saint Aaron and Saint Brendan early in the sixth century. 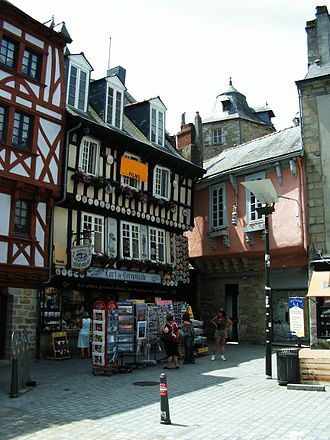 Its name is derived from a man said to have been a follower of Brendan the Navigator, Saint Malo or Maclou, Saint-Malo is the setting of Marie de Frances poem Laustic, an 11th-century love story. 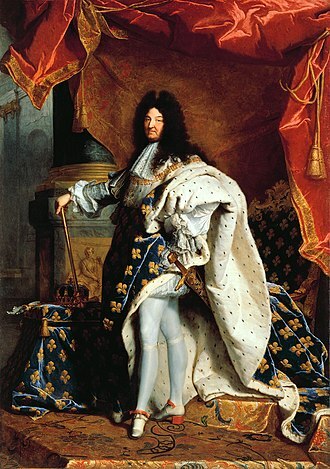 The city had a tradition of asserting its autonomy in dealings with the French authorities, from 1590 to 1593, Saint-Malo declared itself to be an independent republic, taking the motto not French, not Breton, but Malouin. 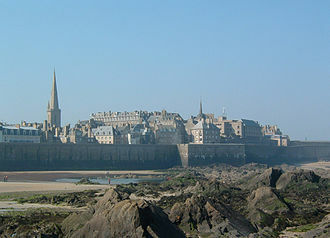 Saint-Malo became notorious as the home of the corsairs, French privateers, in the 19th century, this piratical notoriety was portrayed in Jean Richepins play Le flibustier and in César Cuis eponymous opera. 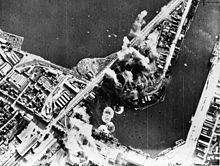 The corsairs of Saint-Malo not only forced English ships passing up the Channel to pay tribute, in 1758, the Raid on St Malo saw a British expedition land intending to capture the town. Saint-Michel tumulus plan (by Zacharie Le Rouzic - Archaeologist who undertook new research and discovered new chests around the central chamber).